Roll up! Roll up! Get your hot German sausages here! The Frankfurt Christmas Market has arrived in town! 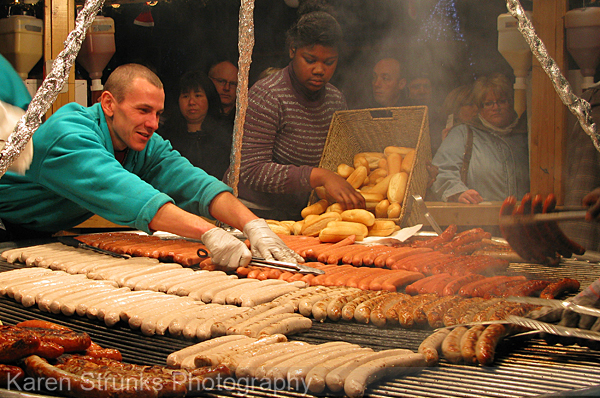 Not only can you snack on a tasty sausage, but there are other deliciously delectable treats to be had; German bread and cakes and sweets, more hot food in the form of pretzels, fried potatoes with garlic, schnitzels, all best accompanied by German beer and heart warming mulled wine. If you are looking for gifts, then you will be spoilt for choice for something a little bit different in the craft fair and if you are feeling a bit adventurous have a twhirl on the traditional wood carousel or slide down the helter skelter!